​In my mother’s eyes, it must have been a violent summer, an endless drought: I remember taking off my heels on a deserted Nanjing street and screaming when my soles touched the sun-baked gravel; my mother crushing mosquitoes between her palms before we fell asleep; kids chucking rocks at our clothesline on Sunday mornings. “Americans,” they jeered as my grandmother’s old bras rattles in the wind. That night, after he hung up, I brushed my hair in my dorm’s cramped shower and imagined her face. Maybe, she had long black hair, small red lips, wide eyes. Softly, I carved my thumbnail in an arc above my eyelashes, lifting my monolids until my eyes in the bathroom mirror were wide and white and round. I remembered watching my mother on Valentine’s Day years ago, carving that same crease with double eyelid tape as she hummed a Chinese melody. The first time she gave me her tape to try, I stuck it eagerly to my eleven year old eyes, smiling when my dad told me it looked pretty. The night of my father’s second wedding, my mom had forgotten to wear her double eyelid tape. Her eyes looked smaller and her mascara had clumped together. But as we ate fried fish on the dock, she smiled at the fisherman, her skin glowing beneath the streetlight. The night we first arrived in China, mom and I slept in our old apartment in the upper east side of Nanjing. After lugging our suitcases to the fourth floor, she searched for her keys. “Okay?” my mom asked. I nodded in response, expecting a sick nausea of old memories as she opened the door. But the fake chandelier, the wooden panels, the white walls of our apartment looked no different than those of our California home. On Saturday nights that summer, I worked at the local hospital. My grandmother, who usually volunteered there, needed surgery for her cataracts and so I covered her shift instead, cleaning scrubs, checking heart monitors. One night, the head nurse had fallen ill, and in desperation, the doctor asked me to assist cleaning in a surgery. I said yes, smiling as I threw on the new blue scrubs and scurried to the operating room. There, the cellophane and green sheets obscured the patient, seven year-old Xin Yan Yang. In the waiting area, I had tried to comfort her grandmother with my broken Chinese. Besides our humanity and our hearts, we shared no points of tangency: I just turned sixteen and had forgotten how to write my own Chinese name. The grandmother was eighty-nine, carried a Mao Ze Dong good luck charm, spent hours watching Chinese soap operas on the hospital’s archaic television, and fawned over the beautiful Chinese actress, Fan Bing Bing. As we watched the doctors roll Xin Yan Yang’s body into the operating room, her grandmother smiled and said that she had never talked to an American before, that I looked pretty. But as she did so, I watched her lips tremble and her eyes water. I had accidentally seen her the night before, kneeling with her prayer beads on the hospital floor. Standing there in my scrubs as the door to the operating room shut, I fumbled with my Chinese. “Bu Yao Zhao Ji.” I had finally found the words to say don’t worry. But by then, Xin Yan Yang’s grandmother had already turned around and begun to walk away. As I watched her hobble down the hall, I realized the waiting room was empty. I was alone. On my hand, I counted the days until the 28th, when I’d be back on a plane to California and could speak to strangers again. I remember walking to the restroom and throwing cold water on my face, staring at my wet reflection. Piao Liang, she had called me. When my mother came to pick me up that night, I remember trying to describe the open heart surgery to her. “A pretty yellow and salmon color,” I molded the air into an imaginary lump, “and heaving like this. Everything was so raw.” I expanded and contracted my palms. My mom didn’t respond, so I slunk back into the passenger seat and watched Nanjing through our window. We passed downtown and the newly built, mirrored skyscraper loomed above the city. In the red light district, I caught glimpses of skin on purple vinyl behind small, barred windows. At the harbor, the men huddled together to skin fish. Street vendors sold fake jade and steamed mantou. “Carissa, I ran into your dad’s wife tonight.” my mother suddenly said. She seemed calm but stayed focused on the road, never turning to face me.“I’m going to get double eyelid surgery tomorrow and I wanted to know whether you’d like to join me.” I stayed silent, picturing Fan Bing Bing’s round and wide eyes in my head. The human brain is the most complicated and unreliable mystery of the known universe. There are more neurons in a single brain than there are stars in the Milky Way. There are two infinities - stars and synapses, polar but parallel - and between them, a space for you and me. This space exists and breathes in ways we will never fully understand, but it is here and in this moment, it is the space between your blue and my brown, both eyes blinking. Once, I woke and mistook the white walls of my dorm room for skin. Everything pulsing. Breaking flakes. I thought of the white and the layers of paint and brick and mud and air it covered. Years before, there had been an incident involving beer cans and a car and, after, I watched my sister’s brain painted, plastered white. Memories like flakes. She stopped sleeping. Her skin paled. That winter was bitter. The hail was endless. Some family time, maybe a year away from school, they decided would be good. My sister’s task was to design the new living room. My parents gave us a brush and twenty dollars and my sister and I started painting the walls a violent blue. We carried tin cans and wore surgical masks to keep away paint fumes. I was young and didn’t understand why she chose that color, but when I look at your eyes now, I know. Blue is the color of surrender and by the time we finished the walls, my sister cut off all her hair and bought herself a new jade necklace. Wore it like a name. I could never tell if it was fake, from one of those penniless vendors in Chinatown. Every night, when I go to sleep, I think of your eyes. I think of all the colors that separate us, all the atoms and odds and numbers between us. I think of the prayer verses my mom reads in the car and then I think of you and our breasts and your eyes and it shocks me - the clarity of the pulse of a heart, the intensity of emotions that defy brains and bibles and beliefs. I will not tell you I love you. Those words need space and time. They do not exist easily. In a photo album, there is a picture of me in a hospital gown smiling with a tube hooked over my lips. I have no recollection of the memory except for the blue hospital gown. When I was young, I used to study my sister’s book on anatomy and galaxies and black holes and brains, and I now understand what it means to defy. To defy is the scar running down my chest in the photo. I imagined gloved hands once pumped and molded my heart there until it beat and beat and beat again. My sister is an optometrist. She is always concerned with clarity, the way light bends. The marvels of the body are mundane and endless. I do know this, however: there are ways we can connect. Neurons and comets are made of the same atoms as eyes and aortic valves. There must be a space where we could do more than hold hands against plaster white walls. There must be a way we could look to the color blue and say, look, we are here. 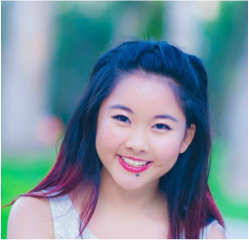 CARISSA CHEN is currently studying at Phillips Exeter Academy and she loves to paint, photograph, and write. Her artwork was selected for exhibition at the President's Committee on the Arts and Humanities and she received a national finalist award from the YoungArts foundation for her photojournalism. Carissa's work is featured or forthcoming in the Kenyon Review and the Adroit Journal​, among others and she is honored to have her poetry recognized by the National YoungArts foundation, the Scholastic Art and Writing Awards, the Lewis Sibley Poetry Prize, and the Bennington College Awards.